Students using the new Nelson Mandela bank notes will not be able to load Kudu Bucks onto their cards as the terminals have not been programmed to accept them. None of the bill acceptors at Wits accept the bank notes which came into circulation in July to coincide with former president Mandela’s 100th birthday. This is the latest in a series of problems with the Kudu Bucks terminals since the beginning of the year. Students have complained before about the terminals swallowing up their money, not accepting money, screens being completely blank and in cases where they have been damaged, not being fixed. 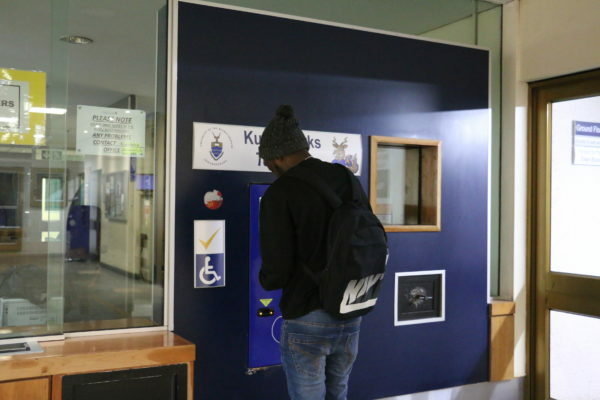 The Kudu Buck terminals are used mainly by students to load money to print and sometimes to buy food from some outlets. The problem is that the university is waiting for new hardware from its supplier in order to program the notes, according to administrative officer Prevani Puckaree. Puckaree told Wits Vuvuzela that, “TSS (Technical Security Solutions) is working to resolve this problem as well as other related problems. “TSS has already requested upgraded firmware from the supplier in order to resolve the matter,” Puckaree continued, saying a variety of solutions from different companies were being sought. This process would take up to the first week of October. The biggest problem facing students is their inability to print if they are unable to load money onto their cards. One of the terminals on West Campus behind the Old Grand Stand has had the screen smashed and is not working at all. However, TSS would not say when this would be fixed. Zoe Sigauke, a third-year Bachelor of Social Work student, said, “I have been trying since Friday, August 10, and [the terminals] are still not working. At the beginning of the year I tried as well and they weren’t working,” she said. Anele Tshabangu, a geography honours student, said she found that all the terminals were down a week ago. “It is very frustrating especially when you have no other way to print,” she said. TSS told Wits Vuvuzela that students were not notified as some terminals were still working.